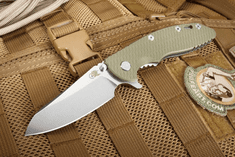 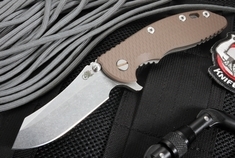 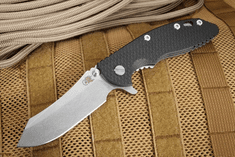 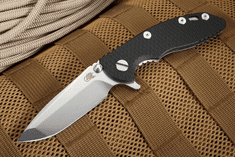 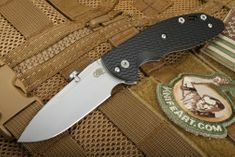 The Rick Hinder XM-18 is a legend in the tactical folding knife world. 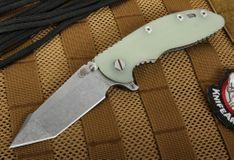 Made in the USA by Rick Hinderer Knives in Ohio. 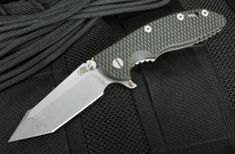 The Rick Hinderer XM18 comes in three different size configurations. 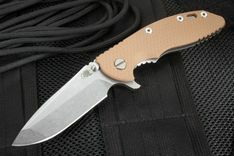 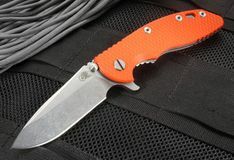 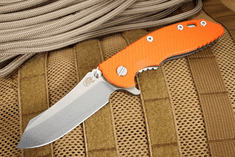 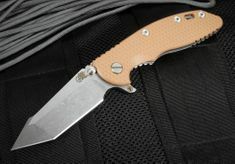 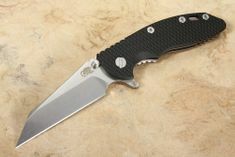 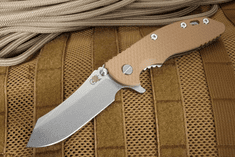 First size is the 3" model, which has a three inch blade and an overall length of 7". Second is the 3.5" model, which has a 3.5" blade and an overall length of 8.25". 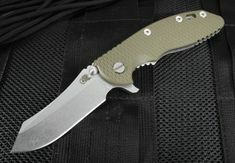 Third is the 4" model, also called the XM-24, which has a blade length of 4" and an overall length of 9.125". 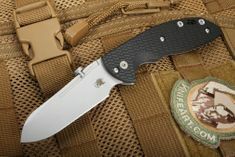 When Rick designed the XM-18 he wanted to design a knife that was a no nonsense tactical tool ready for the simplest cutting tasks all the way up to high speed low drag operations. 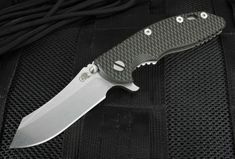 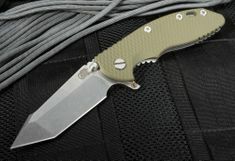 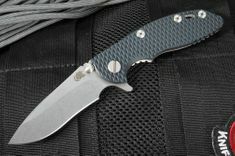 There are two main models of the XM knives, the flipper and the non flipper. 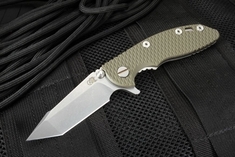 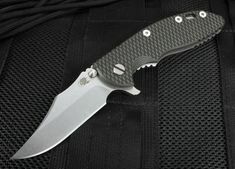 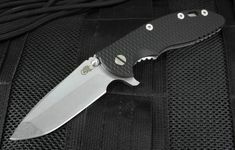 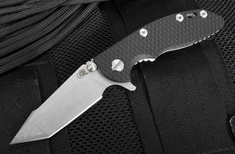 XM-18 and XM-24 knives come in several different blade options, the two most popular are the spanto and the spearpoint. 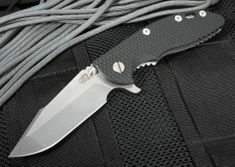 All XM-18 and XM-24 knives come with dual thumb studs on the blade. The thumb stud design is made so that the thumb studs lock up against the frame and add and incredible amount of strength to the sideways torque of the blade as the sideways stresses are being stopped by the whole handle side, thus relieving the stress that would normally be but on the pivot alone. 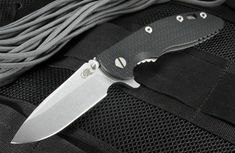 The XM-18 and XM-24 handles are designed to be very ergonomic and comfortable in a wide variety of user positions. The pocket clip can be mounted on the handle blade tip up or blade tip down, which ever style of carry you as the carrier prefer. 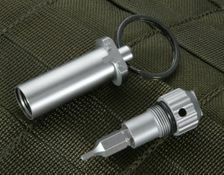 Another great feature of the XM-18 and XM-24 is the lanyard whole in the handle. 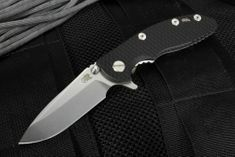 The Rick Hinderer XM-18 and XM-24 have tons of features and options that make these knives some of the most sought after tactical folding knives. 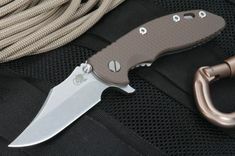 Simply put the Rick Hinder folding knives are some of the best tactical and survival folding knives available.